Top view of the KT88 push-pull tube amplifier. The amplifier is based on Bruce's KT88 Push-Pull Tube Amp but uses new production KT88 Genalex Gold Lion tubes from Tube Depot. 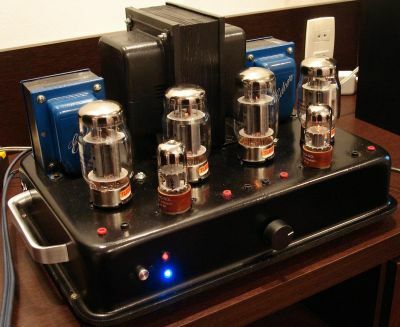 More information and photographs for this build are available in this KT88 Push-Pull Tube Amp message thread.